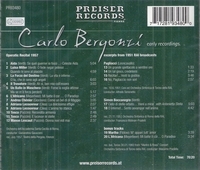 "Bergonzi's 1957 Decca recital and selections from RAI performances, some of which were released on Cetra, are featured on this Preiser release. Early Bergonzi, yet a remarkable demonstration of a beautiful, unmistakably Italian tenor voice. Exquisite sound, artistry galore, a way of spinning out notes and phrases. Bergonzi wasn't a notable physical actor, something you'd never know from his singing, which has plenty of drama that comes from the music. I like the obvious big gutsy Italian tenors from Martinelli to Corelli, yet Bergonzi's way has also worked. I can never hear enough of this man." "The Italian tenor Carlo Bergonzi had a strong sense of style and an exemplary vocal technique. He focused particularly on the operas of Verdi which he sang with noble and elegant phrasing. This CD includes Bergonzi's first operatic recital of 1957 recorded for Decca in its entirety and excerpts from RAI broadcasts from 1951, as well as 2 bonus tracks."